There's a walking path just the other side of my property so when I've previously removed buckthorn, I cut and bagged maybe half of it and left the other half laying in rows like a hedge along my property. Well, I wanted to cut more buckthorn so I could plant some other shrubs in that area, rather than fighting with the same buckthorn seedlings each spring. So my friend Carole and I pulled out all the dead branches that had accumlated over the years and cut them into smaller pieces to fit into yard waste bags. 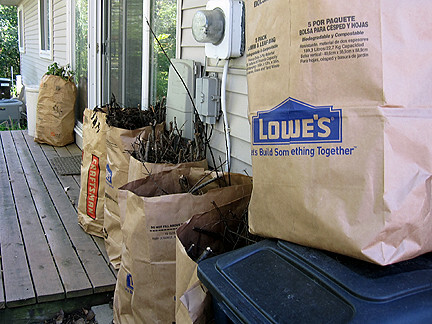 It was enough to fill the seven bags shown here, plus one out front and one bundle of thick branches. Plus about four more bundles, that have yet to be cut to size. Plus two bags that went last week. Whew! After clearing out the mess, I made another mess. I used Ziggy, my trusty chainsaw (as shown in my avatar!) 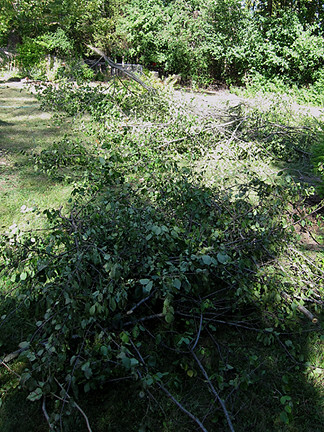 to clear out a bunch more buckthorn. Look at all this crap! A lot of the branches are 12-15 feet long! I have to deal with cutting these to size in the next week or so. My chainsaw chain came off the blade and I have to fix that first. The first photo is salt on the cut. Many of the smaller trees were pulled at the roots and others were chainsawed closer to the ground. 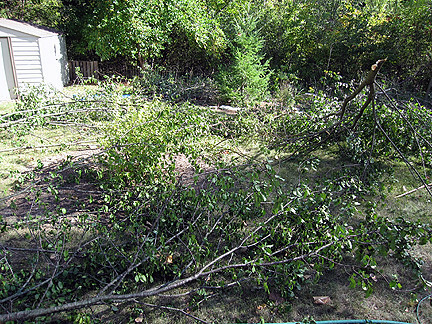 I cut a few off at about three feet and will thread a few dead branches through the stumps to make a sort of very low fence, or at least a property delineation. I usually paint concentrated Roundup (not diluted) onto the stumps with a sponge craft brush, but the guy who cut down a huge tree at my mom's told her to use salt to keep the tree from resprouting. It's cheaper so I'm giving it a go. 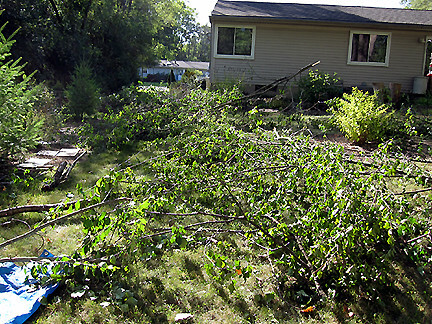 I really, really hate buckthorn. I want to hear you singing . . . or someone . . . I want to hear the song . . . please! This is a marvelous ode to buckthorn. You must have really been stirred to write such a poem. I can't wait to hear you sing it. You asked about Teri on my post about the leaves. That post was supposed to be on my Artsy blog. Somehow I got it on Greenbow. I am not sure I like the new method of uploading my photos. I could have been too tired to do such work that evening. Ha... Teri is an artist friend of mine. She has done lots of fall leaves in the past. You always find a way to make even a nasty seem like fun. But what a lot of work!! I am not familiar with this tree/bush, but it does seem to be very invasive. Hope the salt works-another new trick for me. Monica, Rub that salt into the buckthorn wound! What a dreadful time many of us are having with invasives. I can't control the vinca, bush honeysuckles, privets and stiltgrass~~what if it had thorns! Yikes! Love the hate song! I think your friend carol should video you singing it! So that's Ziggy your holding, not a violin bow! I am so not a detail person! Great poem, deserving of an award. :) I think I feel about Greenbriar as you do about Buckthorn. Chinese Privet too. Also Stilt Grass and Poison Ivy. You have been one busy lady! I think I'd need a long soak in a hot tub and a massage after this much work. By the way, you asked about my going to AZ in February. I do plan to go sometime this winter, but haven't decided when. Are you headed to AZ?? 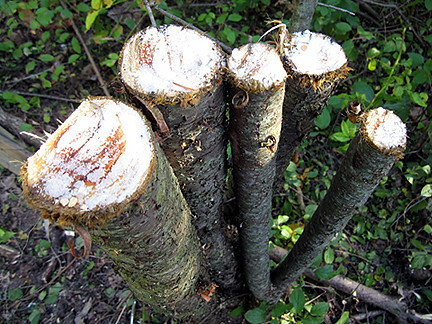 That's a great song and great work on diminishing the Evil Buckthorn! A nice tune to sing while you are taking on a huge task. ;) You've been busy, can't wait to see what you plant in replacement for this beast. I don't have buckthorn here, I have black and honey locust. Murderous thorns. Let us know how the salt works. How do you pack in on to the stump? That's brilliant - I love it! (The song, not the wicked Buckthorn.) I'm looking forward to hearing you sing it. Then I can sing it too, while I'm plucking out Buckthorn seedlings. I'm sorry you have to deal with such large specimens. I was lucky to move to this property while the Buckthorn were only waist high. Good luck with the salt method. Love the song and I bet your chainsaw really gets a good workout! I'm not familiar with this plant but we have enough invasives already. Please, Monica--don't sugar coat it--tell us how you really feel! It seems as though if it grows well with no diseases, it's got to be an invasive! I think it is a fitting end to such an evil scourge to line the pathways with it to warn all other Buckthorns as to their fate. Love the song--can't wait to hear it on yoUTube--it's bound to be a run-away hit! Carole must be a real friend to help with that kind of work. I think you should record it and put it up on YouTube. Great blog... and I agree... I want to hear you singing too! I have some Hawthorn and Prickly Ash that needs some expert attention. Bring your chainsaw and I'll provide hours of fun. Great song! That does it, you're my favorite Michigan blog on Blotanical. How gratifying it must have been for you to take those final pictures right after the massacre. Good job Chainsaw Woman! P.S. The writer is Janice (on the Isle of Wight). I'm leaving her a note about your buckthorn post - hope this is ok.
That sounds like a most uncomfortable task! I'd love to hear the song!! I don't know if my hippophae rhamnoides, (Sea Buckthorn) is as invasive as your buckthorn, but I'm very glad mine is growing in a tub, just in case!! Hello Monica, thanks for your visit last week and commiserations over my pittosporum problem. It does sound very much like buckthorn - the roots and the seedpods. However, unlike you, we tackled only one plant - the others will be future projects! Good luck with clearing it all away. And I think you're very brave using the chainsaw! Love your song. Would love to hear you sing it. (says in a tiny voice) I actually like the variegated buckthorn. It isn't invasive in my neck of the woods, and takes seacoast wind well. I'm going to go hide now. I don't want a poem written about me!!!! Obviously it finally got to you! You have done a pile of work (pun intended!) ;-) I know this will pay off. Do you have to spray something on the stumps to kill them?? Liebe Monica, oh dass sieht nach sehr viel Arbeit aus!!! GG heißt übrigens GötterGatte, also mein lieber Ehemann ist gemeint ;-). Ich hoffe, Du besuchst mich auch weiterhin. Würde mich freuen. Hi Monica, LOVE the song - can't wait to hear it hit the airwaves. I'll download it on my Zune and make sure everyone I know listens to it. Many people have no idea what a horrible plant it is and how it's taking over some of our beautiful forest preserves and other natural areas. Buckthorn and silver maples are about the only seedlings I ever get in the shade garden, even in our lovely (not) large-chunk pine nugget mulch that chokes out about any other seedlings. Buckthorn will sprout in even the most inhospitable of conditions, full sun to deep shade. Not long ago I discovered a spindly, but already pretty tall one growing in the wild no-man's land of the neighbor's yard (behind us. . . you've seen the mess first-hand...) I think they leave the weeds and invasive shrubs there for privacy (or maybe because they don't care how ugly their yard is.) Whatever, the buckthorn will be 'mysteriously' disappearing soon. Love your song....wish I could write like that.....love to hear you sing it!!! It's a long gap between your posts. I guess you must be spending a lot of time in the recording studio at present. I mentioned you on Esther's Boring Garden Blog today (October 8th). Hope it's ok. If not, let me know and I'll change it. We too are wondering about the gap and hope everything is alright. Purrs from your feline friends Siena & Chilli.